Remember the guest that I told you about? Well his mom gave me a big bag of fresh lotus seeds. It did cross my mind to turn them into lotus seed paste as these little nuts were already de skinned. The thoughts of stirring the thick paste to ensure it is cooked thoroughly gives me the shudder. I am defnitely not going to be standing by the stove for hours. Doubt I am in the mood for such laborious work for now. 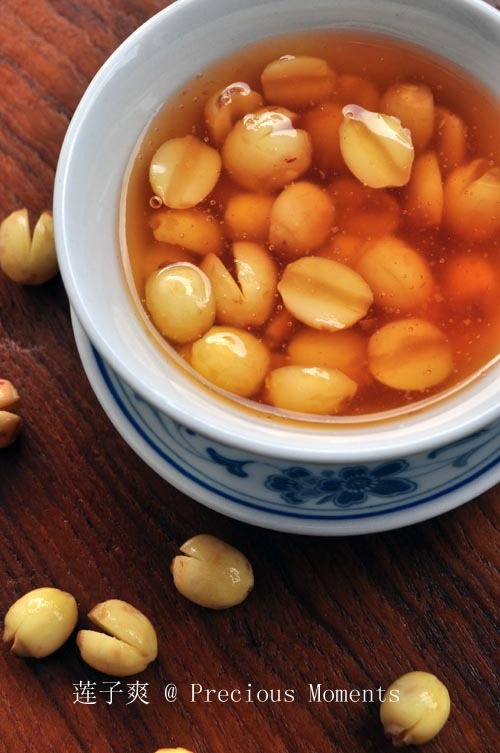 Besides the usual tong shui that we see often, Lotus Seed Sweet Soup 莲子爽 surprisingly is not easily available. For one thing, I am sure it is not the difficulty level in cooking this dessert. My hunch could be the price of lotus seed. The last time I took this was in Chinatown and it was tooth achingly sweet. With this gift, I was determining to replicate this dessert that I love. 莲子爽. This dessert is really nutritional. The seeds are powerful antioxidants and help fight inflammation and aging. It is also a good source of thiamine, phosphorus, potassium and manganese. The health benefits are endless. Yes, you heard me right, anti aging. Perfect for me as I am hitting my mid life crisis. Besides de skinning the lotus seed, this is an easy dessert to prepare. If you buy those with skin, just add a teaspoon of baking powder to a boiling pot of water. Add in the lotus seed and brings to a boil. Remove water and add another pot of fresh water and bring to boil. I was told that this way, it is easier to de skinned. Now you understand nothing beats homemade, because it can be customised to your liking. Care to join me for a bowl? Steam lotus seed for approx 30 - 45 mins till cooked. In a pot, add in sugar and caramelised till golden brown. Slowly add in the water (be careful of splattering). Stir till caramelised sugar is melted and give a golden hue syrup water. Add in potato starch solution, keep stirring as you add. Immediately add in lotus seed and bring to a boil. Stirring constantly. Note: If you are using lotus seed with skin, add a tsp of baking powder to the lotus seed with water and bring to a brisk boil. Remove water and replenish with a fresh pot of water. Bring to a boil and slowly simmer till seeds is cooked. Anti aging, eh? Send a few bowls over! I hope what I read on the internet is true hahahahah.... catch the bowl is coming your way. Next time I will try adding fungus.